During this period the kittens are also learning important lessons from the mother cat and their litter-mates. Kittens learn by observation and they learn best by watching their own mother. Social graces such as using the litter box are learned from mom. How to behave toward other cats is learned from interacting with siblings, occasionally Mom steps in to break up aggressive play. Kittens that are weaned to early often play rough with people, not having learned to inhibit playful biting and scratching from litter-mates. They may also be socially handicapped when dealing with their own species later on. Some early-weaned kittens develop oral fixations – sucking or chewing on objects or their new owners by trying to replace their mother. 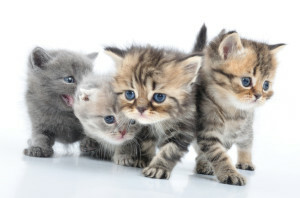 Kittens should not be separated from the litter until they are at least eight weeks old (ten or twelve is even better). A young kitten that is not allowed to explore his natural curiosity will grow up in fear of the unfamiliar things that surround them. As an adult they will be nervous in new environments and unfriendly to strangers. During this acutely impressionable stage, it is extremely important to provide the kitten with a variety of positive experiences which will give him a sense of control over his world and to avoid disciplinary training or any other unpleasant experiences. (This is the time when kittens are most likely to develop an avoidance-response if subjected to physical or psychological trauma). 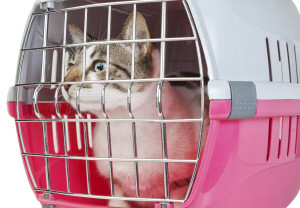 Introduce him to cat carrier and get him used to wearing a harness and le ash when away from home, if you take them with you. Make sure he meets new people and other friendly animals. In short and sweet sessions accustom him to having his paws, ears, and mouth gently touched so that in the future he will accept handling by the veterinarian and nail-trimming and tooth brushing by you. 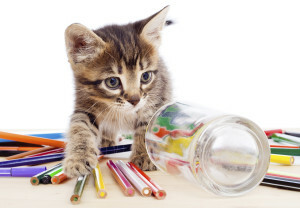 Another way to build your kitten’s self-confidence and help them to become more extroverted is through regular 10-15 minute sessions of interactive play. While you are waving a fishing pole toy, kitty will be exercising his muscles and his predatory instincts in a constructive way. 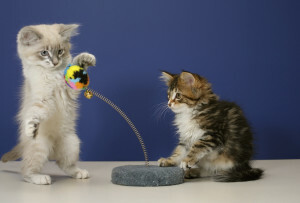 Direct the kitten’s playful aggression toward toys and away from hands and feet. Never allow him to playfully bite into the skin as he will retain this dangerous habit into adulthood when it will be more painful and injurious to his human companions. It is always a good idea to adopt two kittens at the same time. Having a playmate will not lesson your kitten’s attachment to you, but it will supply him with an outlet for his wild bursts of energy, giving you and your house a break. Providing him with a welcome distraction from the monotony and boredom of being home along. 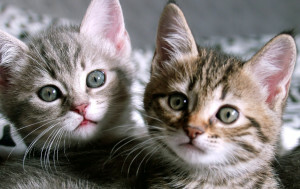 Feline behaviorists agree that most cats are happier and healthier if they have a feline companion. Teach him to jump to the spot where your fingers are tapping (your lap, a chair, his bed, etc.) Call him to you. Give him a verbal command while holding the treat between your fingers. Reward him as soon as he responds. The most important thing you can give them that doesn’t cost one cent is LOVE.